Spain's capital is a fusion of tradition, culture and ambience. A school trip to Madrid opens your eyes to a heady mix of old and new, captured in its beautiful architecture, landscape and stunning tourist attractions like the arcaded square of the Plaza Mayor, located at the heart of the city. 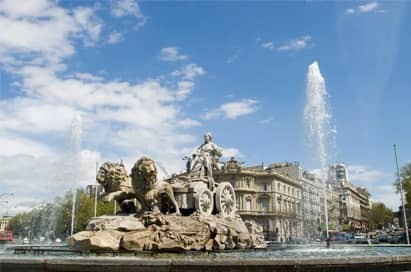 Pupils lucky enough to experience a school trip to Madrid will be captivated by the cities fantastic art collections found in the world famous Prado, Reina Sofia and Thyssen museums, appealing directly to anyone with an interest in Art or History. For those just wanting to learn more about Spanish language and culture, there is no better way than to immerse yourself amongst the "Madrilenos" and enjoy the vibrant city life. A sightseeing tour of Madrid will offer your group the opportunity to see the city's main attractions. A professional, experienced, English-speaking guide will give an insight into the history and culture of the city and will be able to answer any questions you may have. Please ask for prices. See Madrid from a bird's eye view on the Teleférico. 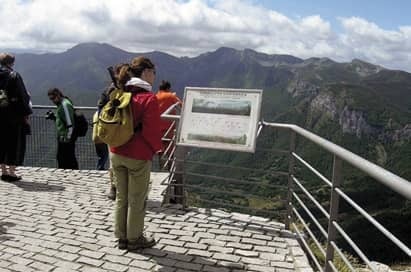 The cable car carries you above the city's parks and a recorded commentary describes the view. Many of the city's famous sights may be seen from the cabins which reach a maximum height of 40 metres. Ronaldo, Zidane, Figo, Roberto Carlos, Raul…David Beckham. 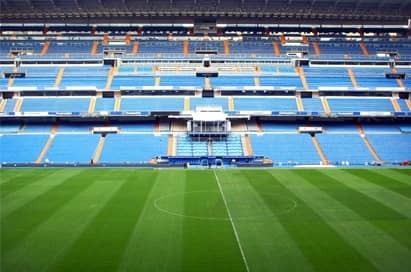 Discover the emblematic Bernabeu Stadium, home of the Real Madrid Football Club, from the VIP box to the changing rooms, from the pitch to the Trophy Exhibition. The Exhibition of the Best Trophies offers a full tour of the legend of Real Madrid. All the European Cups are on show, as well as the rest of the Club's trophies and the most important matches of its history in a modern audio-visual room. These gardens, a symbol of the enlightened period of the 18th century, formed part of the urban re-arrangement project in the area of El Pardo undertaken by Carlos III, who inaugurated them in 1781. Just like the nearby Prado Museum, it was designed by Juan de Villanueva, and in the different areas visitors will find trees, flowers and plants from all over the world, as well as exotic species in the greenhouses. Toledo is only an hour from Madrid and is one of the oldest and most beautiful towns in Spain, surrounded on three sides by the deep gorge of the River Tagus. Highlights include the towering fortress Alcazar and its ring of Gothic and Moorish walls. Include a stop in Aranjuez, the palace which once served as the official spring residence of the Kings and Queens of Spain.